A child of the 80’s, Jaakko ‘Omnilion’ Ahlsten studied English language and journalism in a tiny university in the United Kingdom and graduated as a Bachelor of Arts with Honours with an Upper Second Class Degree (2:1). He also has a Master of Arts degree in Intercultural Communication from a Central Finnish university. Presently he’s occupied in dabbling with the dark arts of communications working in the public sector. He’s a keen musician, living instrument and a music lover, who likes to play games as well. Enjoys movies, literature, friends and a good laugh. Games have been a part of his life since early childhood, including titles like Bubble Bobble, Commander Keens, Slick ‘n’ slide, etc. His first console, which was the start of a keen interest in games, was the Sony Playstation, Anno Domini 1996. Ever since games have been an integral part of his being, and later consoles include Playstation 2, PSP, PS Vita, Playstation 3 and Playstation 4. His favorite gaming series, and the best series ever, is the Metal Gear series, which has inspired his interest in voice acting, voice production, and further fueling his love for music. Other favorites include Final Fantasy games, Hitman series, and Syphon Filter series. He has also dabbled in the game industry by working in a game company as the Head of Communications and taking part in a local game industry co-op activities, winning the silver medal in a Tekken Tag Tournament 2 competition. Music on the other hand came about to him later, although he had always been surrounded by music as he is from a musical family. He took up piano in 2000 until his piano teacher moved away and decided then to make a change of instrument and ended up on the guitar in 2001 , which has stayed with him to this day. 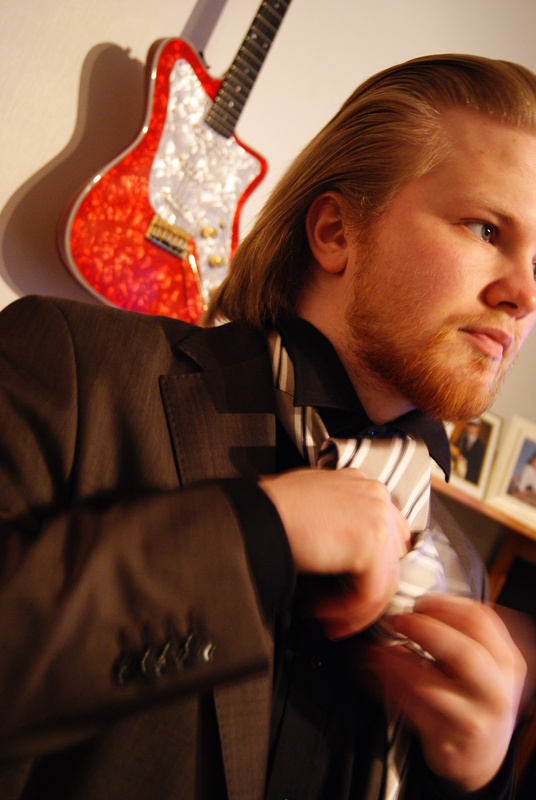 He studied at Madetoja Music high school in Oulu and Oulu Pop & Jazz conservatoire, both which had a big impact on him musically. Major influences include Ritchie Blackmore, Marzi Nyman, Tommy Emmanuel, James Taylor, Roy Book Binder and the sort. A chat about music is always welcome with this man, and G.A.S. (Gear Acquisition Syndrome) is always an issue. At the moment, he is in posession of two acoustic steel strings and three electric guitars plus more than loud amplification. He has the makings of a tap dancer with all those pedals he keeps putting his foot down on. Favourite game: Metal Gear Solid 2 Substance. Though now I am tempted to say Metal Gear Solid 5 The Phantom Pain because of reasons. Hold on, scratch that. Now it’s Tom Clancy’s Ghost Recon Wildlands. Nevermind, I give my unreserved praise to Horizon: Zero Dawn, though I’ve recently replayed Batman: Arkham Knight and started Arkham Asylum. Any further inquiries should be addressed to Yours truly, if there are any.